Tabata, I., Nishimura, K., Hirai, Y., Ogita, F., M, M., & Yamamoto, K. (1996). Effects of moderate-intensity endurance and high-intensity intermittent training on anaerobic capacity and VO2max. Medicine in Science in Sports and Exercise, 1327-1330. High-intensity interval training (specifically 20 seconds exercise: 10 seconds rest for 4 minutes) will improve both aerobic and anaerobic systems simultaneously. The four minute 20 second : 10 second protocol is the only proven method to train both aerobic capacity and vo2 max at the same time. Until recently, research has not quantified or identified the benefits of high intensity interval training (HIIT) anaerobic activity. 60 minutes of steady-state exercise vs.
4 minutes of HIIT- 8 intervals of 20 seconds exercise: 10 seconds rest (Tabata protocol). 18-24 year old male college students majoring in physical education. Many participants were physically active and members of varsity athletic teams. After receiving detailed information of the purposes, benefits, and risks associated with this study, each student participant provided written consent. Each experiment (pre-test included) was performed on a mechanically braked stationary cycle ergo-meter (Monark). Oxygen input and carbon dioxide output levels were measured by a mass spectrometer (MGA-1100, Perkin-Elmer Cetus). This study included two separate experiments, which both lasted 6 weeks in duration. Subjects’ maximal accumulated oxygen deficit and VO2max was measured before, during and immediately after the 6 week study. While subjects maintained specific rpm for each experiment, the intensity (resistance) on the cycle was modified to reach each subject’s specific VO2max. For example if the goal was to reach 70% of VO2max while maintaining 70rpm but the subject was only reaching 60%, the resistance on the cycle was increased to further challenge the subject until the desired VO2max was maintained. Prior to each training session, participants performed a 10 minute warmup at 50% of VO2max. 85rpm on cycle (if subject could perform 9 sets of intervals at this speed, exercise intensity was increase by 11 W.
30 minutes of steady-state cycling followed by 4 non-exhaustive intervals at 170% of VO2max. VO2max- Maximum amount of oxygen that a person’s body can process. Measured in milliliters per/kilogram of body weight per/minute. Anaerobic capacity- Maximum accumulated oxygen deficit during an exhaustive anaerobic sprint exercise. The main finding of this study was that 6 wk of aerobic training at 70%·VO2max improved the VO2max by 5 ml·kg-1·min-1 in moderately trained young men but that the anaerobic capacity, as judged by the maximal accumulated oxygen deficit, did not change. 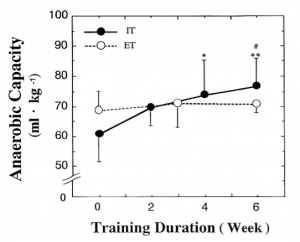 The second finding is that 6 wk of training using high-intensity intermittent exhaustive exercise improved ·VO2max by 7 ml·kg-1·min-1 and the anaerobic capacity by 28%. This is to our knowledge the first study to demonstrate an increase in both anaerobic capacity and maximal aerobic power. 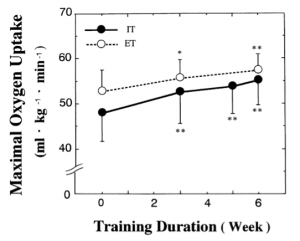 This study demonstrated that 6 weeks of moderate steady-state endurance training did not affect anaerobic capacity. However, 6 weeks of high-intensity interval training (specifically 20 seconds exercise: 10 seconds rest, 4 minutes, 170% VO2max will improve both anaerobic capacity and VO2max simultaneously.